Fall migration seems to have cooled down locally, with not much turnover occurring. Fall is definitely in the air here, as morning lows have been in the low 40's recently. While waiting for the next big cold front to come in with some force and stir things up bird wise, I have been enjoying some of the harder to find birds that have been around all summer. 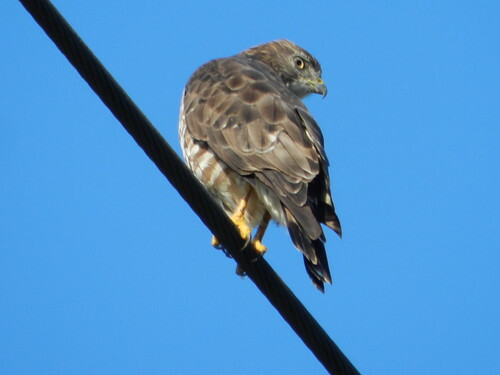 While Broad-winged Hawks breed around my neck of the woods, I rarely see them outside of migration. I spied this bird perched on a wire last week. This bird was very near a spot where they used to nest. 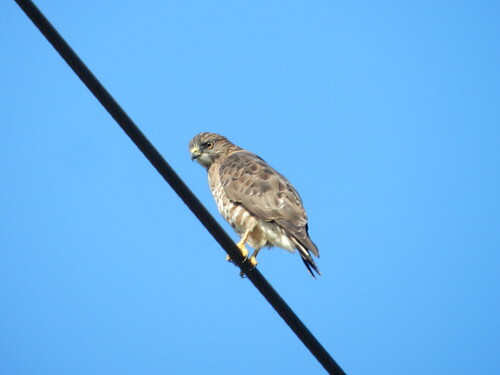 Not sure if it is a migrant or a local. Using the car as a blind, I snapped these quick shots out the car window. While hearing them up in the woods for most of the summer at East Fork, I have not payed much attention to their presence. This is because past experience with trying to see and or photograph them usually has proven to be very difficult. However, after other birders have spotted them moving around the trees near the lake, they have become very popular locally. Yesterday, I decided to spend some time with them - just watching them and also attempting to get a somewhat OK picture of one. They are not the easiest of birds to photograph! The birds have been very active and territorial, chasing almost everything out of their feeding territory. 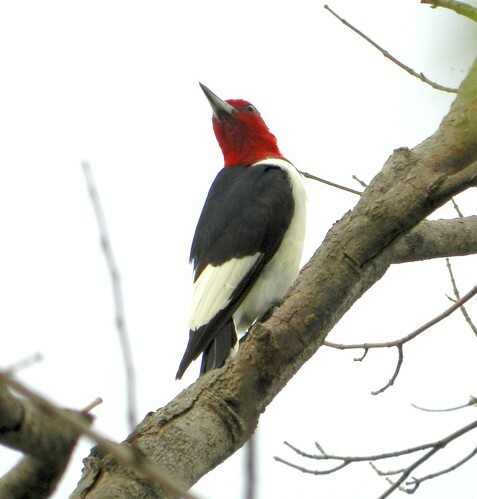 I have witnessed scuffles between them and Blue Jays, squirrels, and other red-headeds. Such a nice looking bird. There is nothing like watching them fly around over your head. Many birds were caching acorns for the winter in the nearby dead trees. I hope this is a sign that they intend to stay in the area for the winter. The lighting here is a challenge for photography, but I was able to get a couple OK close ups. They do not stay still very long. 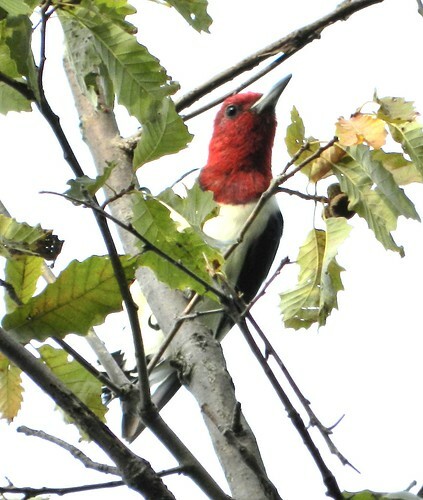 I spent about three hours just watching the Red-headed Woodpeckers. Just awesomeness - I think I could spend a whole day watching them! Great birds Dan! It's nice to take a moment to appreciate the great locals too before the migration madness. 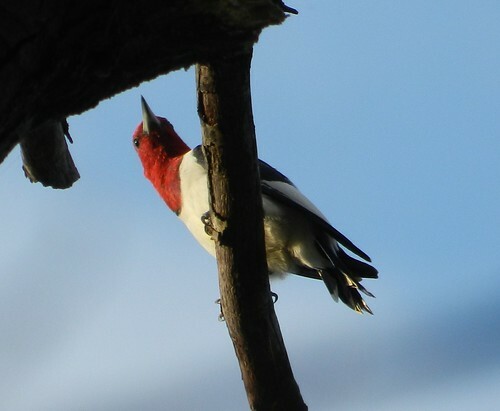 Red-headed Woodpeckers are awesome subjects! 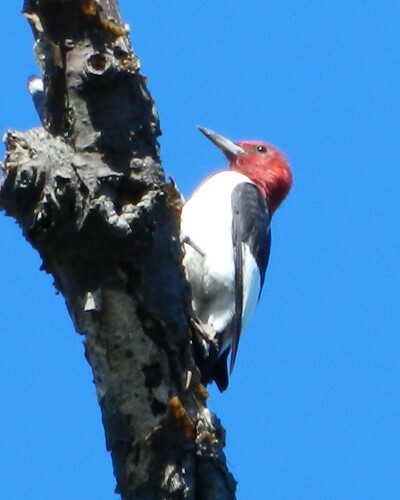 I agree, Red-headed Woodpeckers are fabulous! During the winter months I visit an area preserve where three or four reside. They are so much fun to watch and very handsome birds. Terrific photographs! 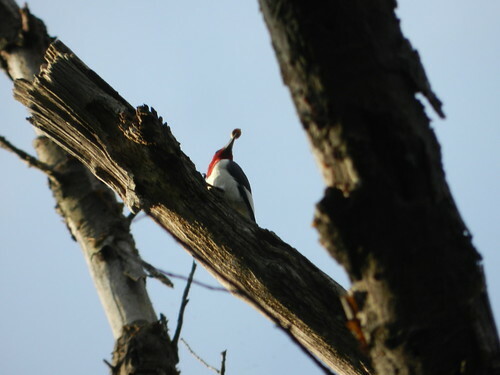 I just love the Redheaded Woodie, great photos.